A complete informative guide to preparing a stock car for paved track competition. Practical information you can use to make your car faster, more reliable, & more competitive. Full of bold graphics & drawings, along with over 300 photos & illustrations. 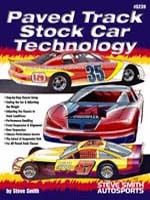 Useful for every class of paved stock car. 176 pages. SPECIAL PACKAGE: Buy both the S239 book and V279 video together for only $62.95.